Title: WARNING! NO AMERICAN PATRIOT -- OR FUNDAMENTAL BORN AGAIN CHRISTIAN -- SHOULD BE AT HOME DURING ANY NATIONAL HOLIDAY ! Subtitle: New Age author, Bill Cooper, issued this warning in the early 1990's. Given the timing of the events since September 11, especially the Anti-Terrorism legislation giving President Bush dictatorial powers, we thought the time right to broadcast Cooper's bold warning! New Age author, Bill Cooper, wrote a book in the early 1990's entitled "Behold A Pale Horse ". 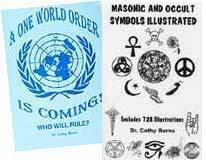 While I do not believe Cooper is saved, based upon several phone conversations I had with him shortly after his book was issued, I do believe Cooper has come to realize the horror of the plans of the New World Order and wants the plans exposed. Cooper spent a career in U.S. Naval Intelligence and was regularly sent on Temporary Duty to work on a project entitled, New World Order. Cooper gives a wealth of information he gleaned from inside sources that fleshes out the information I have seen elsewhere; therefore, Behold A Pale Horse has become a very useful resource. We encourage you to read this book, but you have to buy it through the New Age bookstore line of distribution, since that is how he disseminated it originally. In Chapter Five, entitled, "Good-bye USA, Hello New World Order", Cooper speaks of "the plan to suspend the Constitution and declare martial law". In the first part of the chapter, Cooper speaks of the plan to destroy the balance of Constitutional Power, and reveals how this plan was carried out. You will be shocked to learn that this plan was instituted by a joint effort of President Bush [Senior] and Congress, using the Iraqi invasion of Kuwait as their springboard! In other words, both Presidents Bush have used national emergencies to get legislation passed that will one day take our freedoms away! Congress in both instances gave the Presidents Bush exactly those powers for which they were looking. Now, you know how it was possible for President Bush [Junior] to act so swiftly, so decisively, after the September 11 attacks, to formulate a plan against Afghanistan and then simply announce it, rather than going to Congress for either a declaration of war or any other type of authorization. And, you know something? Most Americans are so blissfully ignorant of how our government works, the vast majority did not realize anything special or different was occurring. Now, you understand how it is possible for the current Bush Administration to claim that the President has the authority to carry out covert operations against Osama bin Laden, including the authority to assassinate him! This secretly passed bill gives him that authority. This bill "lay in the weeds" undetected for 11 years 1 month, before the attack on September 11, 2001, when its provisions were enacted! Cooper then begins to speak of a special government operation designed to round up patriotic Americans and anyone else who might not accept the coming New World Order dictatorship, or who may simply be very upset that our precious Constitution has been dissolved because of the artificial crises! This operation is called the Western Virginia Office of Controlled Conflict Operations, but its nickname is Mount Weather. This agency was designed in the early 1950's as part of the "continuation of the government" program in the event of a nuclear attack. "In June, 1975, Senator John Tunney (D), California, chairman of the Subcommittee on Constitutional Rights, charged that Mount Weather held dossiers on at least 100,000 Americans. He later alleged that the Mount Weather computers, described as 'best in the world', can obtain billions of pieces of additional information on the personal lives of American citizens simply by tapping the data stored at any of the other 96 Federal Relocation Centers. I know from my stint with the Office of Naval Intelligence that these dossiers consist of information collected about American patriots, men and women who are most likely to resist the destruction of our Constitution and the formation of the totalitarian police state under the New World Order. The patriot data bank is constantly updated so that, when the appointed hour arrives, all patriots can be rounded up with little, if any, effort. The plan calls for this to be accomplished in the dead of night on a national holiday. The most likely holiday is Thanksgiving, when [nearly] everyone, no matter the religion, race, or creed, will be at home. The targets will be ripe for the picking after a heavy meal, maybe some alcoholic beverages, and during a deep sleep. There is a traitor in the patriot movement who provides the Secret Government with accurate names and addresses of patriots who will fight to protect and defend the Constitution." "MY RECOMMENDATION IS THAT NO PATRIOT SHOULD EVER BE AT HOME OR AT THE HOME OF ANY FAMILY MEMBER ON ANY HOLIDAY EVER AGAIN UNTIL THE ... CONSTITUTION IS RESTORED AS THE SUPREME LAW OF THE LAND." [P. 116, capitalization was in the original]. Truly, these are the End Times and the final stages are bearing down upon us. Are you spiritually ready? Is your family? Are you adequately protecting your loved ones? This is the reason for this ministry, to enable you to first understand the peril facing you, and then help you develop strategies to warn and protect your loved ones. Once you have been thoroughly trained, you can also use your knowledge as a means to open the door of discussion with an unsaved person. I have been able to use it many times, and have seen people come to Jesus Christ as a result. These perilous times are also a time when we can reach many souls for Jesus Christ, making an eternal difference.